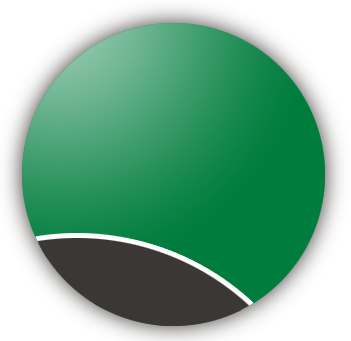 Spring Texas Real Estate | Homes For Sale Spring TX | Spring Texas Realtors How accurate is the Zestimate for your Spring Texas home? A little over 2 years ago, I compared the sales prices of 10 Spring Texas homes to their Zestimates. 70% of the Zestimates were within 10% of the sales price. 80% of the Zestimates were higher than the sales price. Since I am frequently asked about the Zestimate, I figured it was due time to perform another comparison. I chose 10 Spring Texas homes that sold within the last six months and compared their sales prices to the Zestimates. 80% of the Zestimates were lower than the sales price. What I found interesting was in 2009 the Zestimate was higher in 80% of the instances but in 2011 the Zestimate was lower in 80% of the instances. 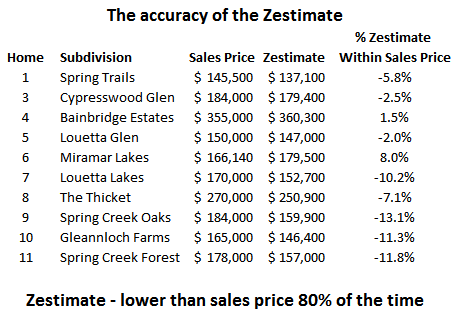 If you were buying a house in 2009 in Spring Texas and you checked the Zestimate, you probably thought you were getting a deal. Today if you used the Zestimate to check the value of a Spring Texas house, you would think you are over paying. The Zestimate is just that an estimate. Zillow does not send anybody out to view the interior and exterior of the homes to evaluate their condition. If you truly want to know the value (not an estimate / guesstimate) of a Spring Texas house, contact a Realtor. You can contact me at 281.804.8626 or my working partner (Rick Ratchford) at 281.300.3141.